Aco Mold is a good reputation plastic injection molding company in China. Our injection molding shop equipped 12 sets of plastic injection molding machines, range from 40ton to 800 ton, we provide 24 hours a day, 7 days a week automatically production services. The plastic resin we selected covers a wide range, includes ABS, PC, PP, PA, PMMA, POM, PE etc. We build the molds for plastic injection molding, at the beginning of the mold design, we take the injection molding into consideration, it allow us to be able to achieve the shortest molding cycle time, minimum maintenance cost. Every second of cycle time and every piece of plastic raw materials we selected would eventually benefit our customers. Low volume production order are welcome as well, it always happened when customer feel the cost is unbearable especially the mold making cost. Aco Mold is able to provide a full range of solutions to lower down your budget for low volume project with good quality. Our experts work with you together to find the best solution for your companies. We are experienced with various plastic injection molds for automotive, medication, lighting, sport equipment, home appliance, and agriculture. Our mold factory located in Shenzhen China, covers an area of more 4000 square meters, it's closed to Hongkong, Guangzhou and Dongguan, which is very convenient for your company to do inspection and ship finished plastic products. Currently we have 60 excellent mold makers employed in our company, most of the them have good education in plastic injection molding industry, they take pride in their works, we are able to provide 30-40 sets of injection molds per month. To satisfy global companies' highest requirements, we invest on the latest technology continuously and equipped the most advanced mold manufacturing facilities, we have full in-house plastic injection mold manufacturing, injection molding, painting, assembly capacity, our equipment includes but not limited to: 8 sets of CNC, precision 0.005mm; 14 sets of mirror EDM, 8 sets of slow wire cut, 12 sets injection molding machines range from 40 Ton to 800Ton, 1 set of 2d projection measurement, 1 set of CMM. We can build plastic moulds and die-casting maximum 7.5 tons, molded plastic parts Maximum 1200g. We also use the advanced CAD/CAM/CAE system, we can work with data format in pdf, dwg, dxf, igs, stp etc. Aco Mold is a ISO9001:2000 certified plastic injection mold company in China, we are always ready to offer best service to your company, well organized management system ensure us to provide cheap and high quality molds and molded plastic parts for global companies. Plastic injection molding process begins with the gravity feeding of polyolefin pellets from a hopper into the plasticating /injection unit of the molding machine. Heat and pressure are applied to the polyolefin resin, causing it to melt and flow. The melt is injected under high pressure into the mold. Pressure is maintained on the material in the cavity until it cools and solidifies. When the plastic part temperature lower than the material's distortion temperature, the mold opens and the plastic part is ejected. The complete injection process is called a molding cycle. The period between the start of the injection of the melt into the mold cavity and the opening of the mold is called the clamp close time. The total injection cycle time consists of the clamp close time plus the time required to open the mold, eject the plastic part, and close the mold again, the injection molding machine transfer the resin into molded parts through a melt down, injection, pack, and cool down cycle. A plastic injection molding machine includes the following major components as below. Injection system: feed the raw materials into cylinder, heat up and melt it down, push the melted materials into the cavity through the spure. Hydraulic system: to provide the force of injection. 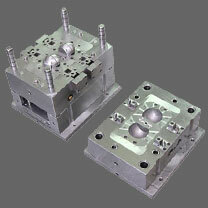 Mold system: to load and assemble the mold. Clamping system: to provide packing force. Control system: to control action, cooling system. Clamping force is commonly used to identify the capacity of the plastic injection molding machine, other parameters include shot volume, injection rate, injection pressure, screw, layout of inject bar, mold size, and the distance between tie bars. Plastic injection molding machines can be divided into several categories, besides general-purpose machines for normal plastic parts without high precision or unusual design, there are tight-tolerance machines especially for high precision parts, and high-speed machines for thin-wall parts. 1) The mold closes and the screw begins moving forward for injection. 2) Filling, eject melted raw materials into the cavity. 3) Pack, the cavity is packed as the screw continuously moves forward. 4) Cooling, the cavity cools down as the gate freezes off and closed, the screw begins to retract to plasticize material for the next cycle. 5) Mold open and part ejection, the mold opens and parts are injected out by ejection system. 6) Close, the mold closes and the next cycle begins. We are ready and looking forward to cooperate with your next project, contact us NOW, you will be satisfied to choose us as your injection molding manufacturing facility in China.